Lithium-Ion Battery technology hasn't changed much since 1991 when they first became commercially available. Although the devices that use them now need a lot more power to run than the devices that used them couple decades ago. And that's the problem why your smartphone barely lasts a day on a full charge and your laptop barley survives 3-5 hours before it needs a socket. Researchers at the Washington State University have found a way that could triple Li-ion battery capacity plus make them charge faster and give them more charge cycles than existing Li-on batteries. 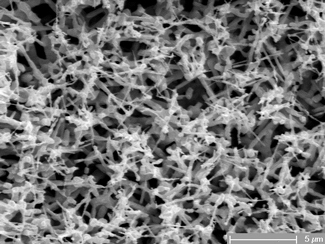 A research group led by 'Grant Norton' a professor at the School of Mechanical and Materials Engineering, the researchers have filed patents on this nanoscale-based technology. The existing Li-ion batteries utilize a graphite anode (positive terminal). The key difference that makes these new batteries better is the anode, instead of graphite its made of Tin. Norton and postdoctoral researcher Uttara Sahaym developed the idea for this novel material a little over a year ago while working on a project to reduce the problem of tin whiskers. Tin Whisker are a major problem which cause damage to electronic components. These whiskers can sometimes grow as long as 10 millimetres, are a big problem in microelectronics because they cause short circuits and arcing that can cause severe damage to electronic components and reduce reliability. Despite the fact that tin whiskers have been causing problems for more than 60 years, researchers have been unable to come up with ways to entirely avoid them. The only popular way is to add lead to the tin solder material but lead has its environmental problems and its use has been restrained by the European Restriction of Hazardous Substances Directive (RoHS). In the process of trying to do away with Tin whiskers the researchers found a way to utilise this property to some good use in battery technology. 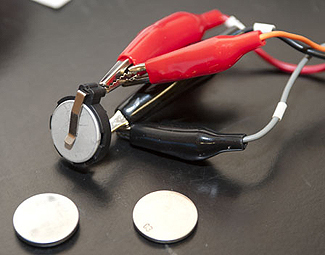 During charging a Lithium-ion battery, the lithium ions move from the cathode to the anode. The anode holds the lithium ions and stores the battery’s energy. When the battery is put to use, the ions move from the anode to the cathode, discharging electrons and creating an electric current. So with the tin anode which has these nano scale (nano needles) whiskers the anode has more surface area and can hold up more charge than a graphite anode. Not only that its also said to cheaper than a Graphite anode. So the end product is a battery that's almost the same in size and structure but has a lot more capacity than the existing one. Electronics manufacturers wont have to redesign their products to accommodate this new battery. The researcher hope to bring it to the market within a year. I hope that happens for good.